“Scream 4” begins on the fifteenth anniversary of the original Woodsboro murders, high school students Jenny Randall (Aimee Teegarden) and Marnie Cooper (Brittany Robertson) are attacked and brutally killed by a new Ghostface. The following day, Sidney Prescott (Neve Campbell) returns to Woodsboro to promote her new book with her publicist Rebecca Walters (Alison Brie). Sidney becomes a suspect in the murders after evidence is found in her rental car, and she must stay in the town until the murders are solved. Her cousin, Jill (Emma Roberts), who is dealing with the betrayal of her ex-boyfriend, Trevor Sheldon (Nico Tortorella) gets a threatening phone call from Ghostface, as does her friend Olivia Morris (Marielle Jaffe). Jill and Olivia, alongside their friend Kirby Reed (Hayden Panettiere), are questioned about their calls by Dewey Riley (David Arquette), who is now the sheriff of the town, and one of his deputies, Judy Hicks (Marley Shelton). Meanwhile, Dewey’s now-wife, Gale Weathers-Riley (Courteney Cox), is struggling with writer’s block. Sidney stays with her aunt Kate Roberts (Mary McDonnell). Later that night, Olivia, who lives next door to Jill, is attacked and murdered by Ghostface as Jill and Kirby watch in horror while Sidney was interrupted by a scream while reading her book. Sidney and Jill were injured in their attempt to save Olivia, and are taken to the hospital, where her publicist Rebecca is murdered in the parking garage. Gale, trying to solve the murders, enlists the help of two high school movie geeks, Charlie Walker (Rory Culkin) and Robbie Mercer (Erik Knudsen), who explain that the killer is using the rules of movie remakes to murder. Charlie concludes that the killer will probably strike at a party being held that night. Can the group of teens stop the killer before it is too late? 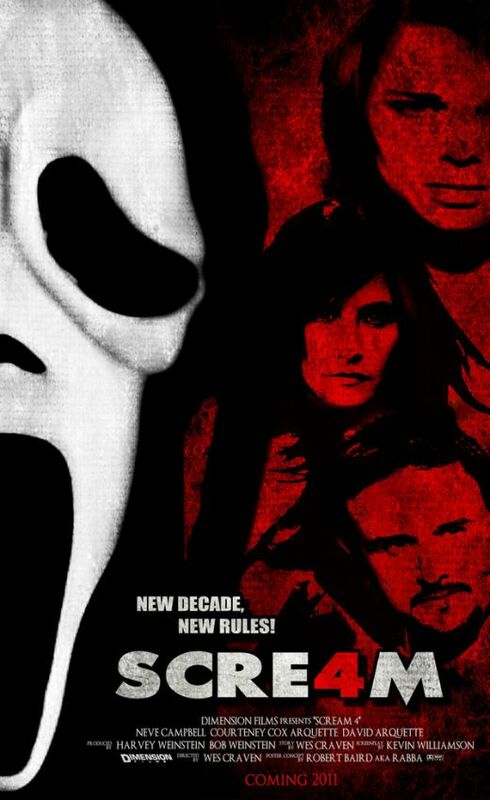 “Scream 4” is executed with an artistic flair of wit and style that long time fans and film buffs alike will love. While I sometimes wished there could have been a little more genuine tension and suspense, the final twenty minutes are just so off-the-wall that it makes up for any slow patches. All in all, this is bloody, fun, and very entertaining. The cast is clearly having a ton of fun, and most of them really put on a good show. This may be cinematic junk food but it sure is tasty.